Lorusso participates in FLUID SYSTEMS, an exhibition at the UCLA Art|Sci Gallery featuring members of the Sci|Art Nanolab team and their creative approaches to systems in ecology, medicine, and life sciences. FLUID SYSTEMS explores the myriad relationships between flows on the micro and macro level. David Prince introduces us to the art of making Kombucha. Rita Blaik reveals how dissolved particles in water scatter light in unique colors and patterns, through a phenomenon known as the Tyndall effect. Capillaries of zebrafish in Olivia Osborne’s research on nanotoxicology connect with the flow of blood in our bodies, videos by Mick Lorusso of rivers and estuaries, and the melting of their collaborative ice sculptures in the gallery. 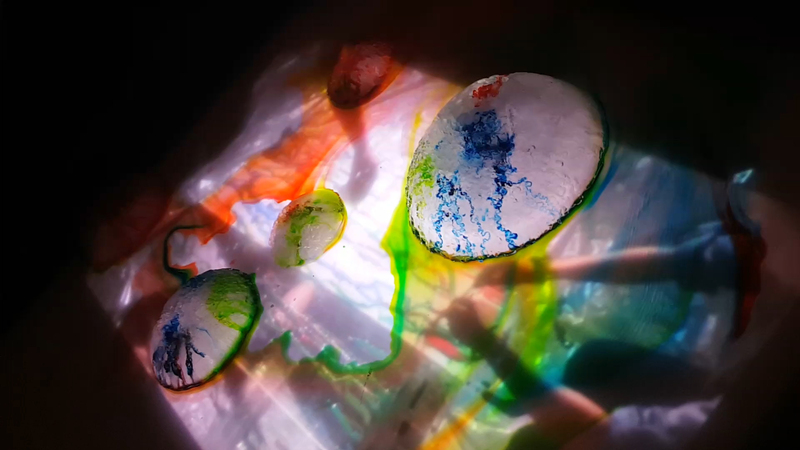 Dan Wilkinson shares jostling non-Newtonian fluids with us, and Amisha Gadani shows us her experiments with the flow of fabrics and objects through water. A collective Water Canning stand—made by the Art|Sci Collective, including Mick Lorusso, Dawn Faelnar, Victoria Vesna and Judy Kim—allows participants to take a can of water home and participate in this flow of water on many levels, from the nano to the global.